Programmable thermostats (AKA “smart thermostats,” “WiFi thermostats”) can help you save money by reducing wasted heating and cooling while you’re away from home, but there are a lot more benefits! Smart thermostats help you enjoy better comfort when you wake up in the morning and when you come home from work. They even have nifty features like touchscreen displays with weather forecasts, reminders to change your air filter, and more. The technicians at Glenbrook Heating & Air Conditioning will be happy to help you choose the right programmable smart WIFI thermostat for your Chicago, IL area home. Professional installation for smart thermostats makes it easy to learn how to take advantage of the device’s features, connect it to your phones and tablets, and ensure that it’s precisely set up for accurate functionality. 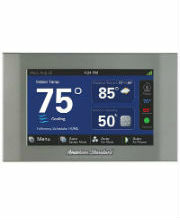 Contact us to schedule a smart thermostat installation in Chicago’s North Shore area. Call 847-729-0114 or request a free estimate online. Glenbrook Heating & Air Conditioning has been awarded the American Standard Customer Care Excellence Award, and we proudly install cutting-edge, Wi-Fi enabled, smart thermostats by this leading brand. As an American Standard Customer Care Dealer in Chicago’s North Shore, we’re proud to partner with one of the leading brands in heating and cooling equipment. 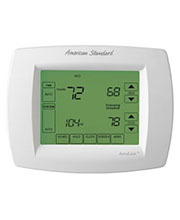 American Standard thermostats have all the bells and whistles you want near me, yet they’re exceptionally easy to use. 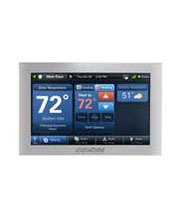 Here are some of the most popular options of Wifi thermostats we install. Our technicians are licensed and insured HVAC installers, and our team will be glad to help you compare options for smart thermostats and pick the one that’s right for your budget and preferences. Start with a free estimate, and we’ll explain how a smart thermostat can help you save on energy bills while actually improving your air quality and comfort! Glenbrook Heating & Air Conditioning has been operated by the Yurk family in Chicago’s North Shore area since 1969. We promise friendly and helpful service, top-quality installations, and dedicated repair and maintenance services whenever you need us! Upgrade your home with the best home internet-enabled smart thermostat installed by professional HVAC technicians. Call 847-729-0114 or contact us online for a free estimate for thermostat installation in the North Shore area.